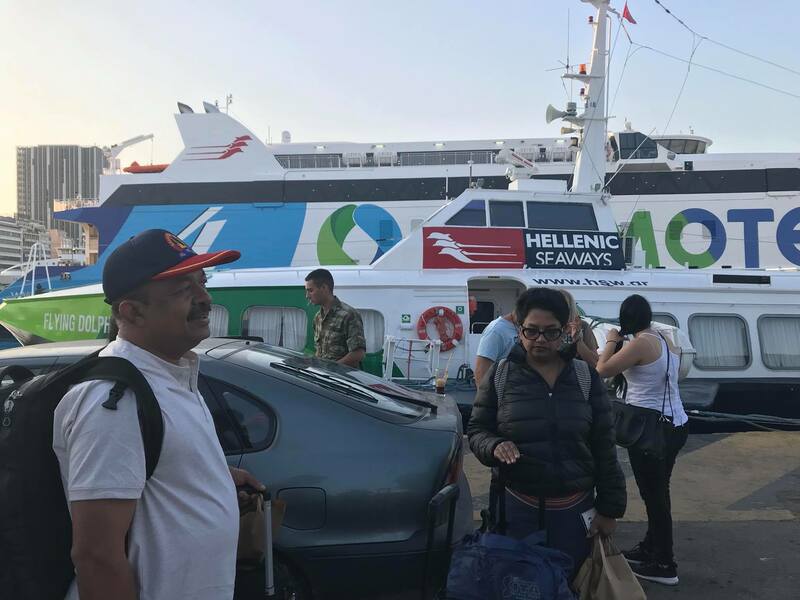 Early morning on June 11, we checked out of the hotel and drove to Piraeus Ferry Port and boarded the high-speed ferry operated by Hellenic Seaways. The journey of about three hours was very comfortable, more so because it was a large ferry and hence more stable. Food in the restaurants onboard was pretty expensive. Luckily our hotel had provided us with packed breakfast. I would recommend travellers to read a book or watch a downloaded movie during this journey. 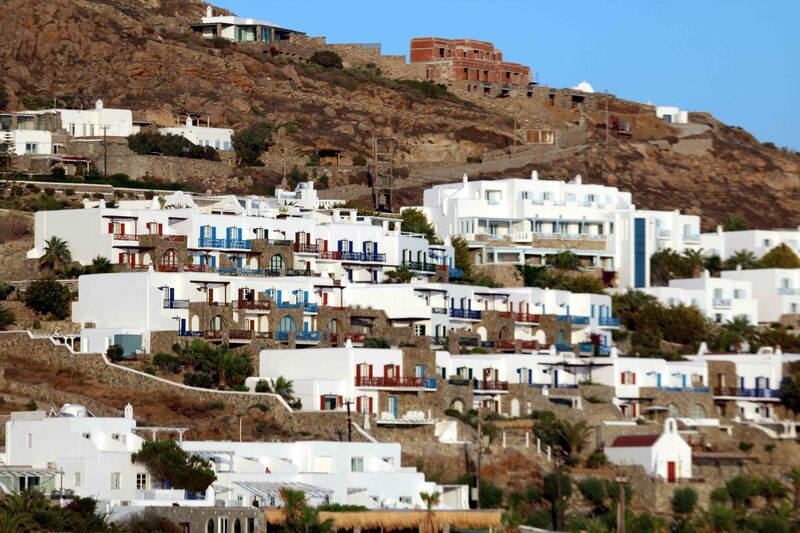 After three hours of sailing on the Aegean Sea, Mykonos Island with its prominent whitewashed buildings with blue windows and doors came into our view. 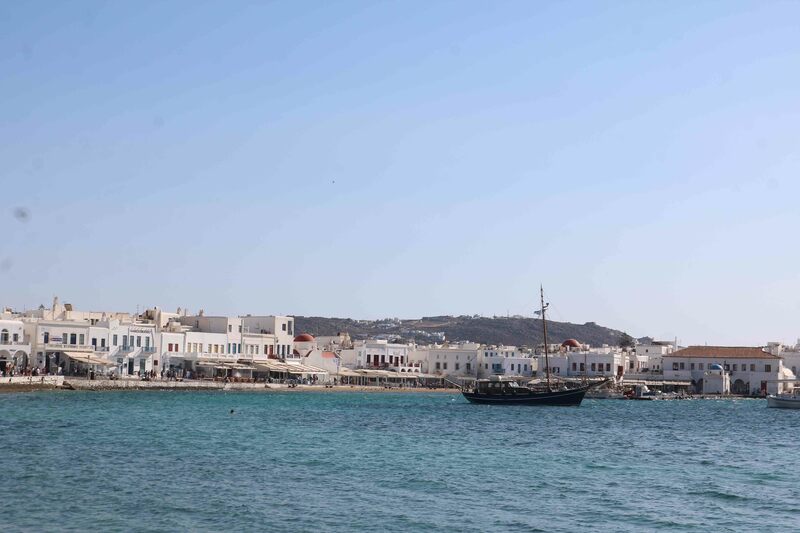 As per Greek mythology, Mykonos was formed from the petrified bodies of giants killed by Hercules. 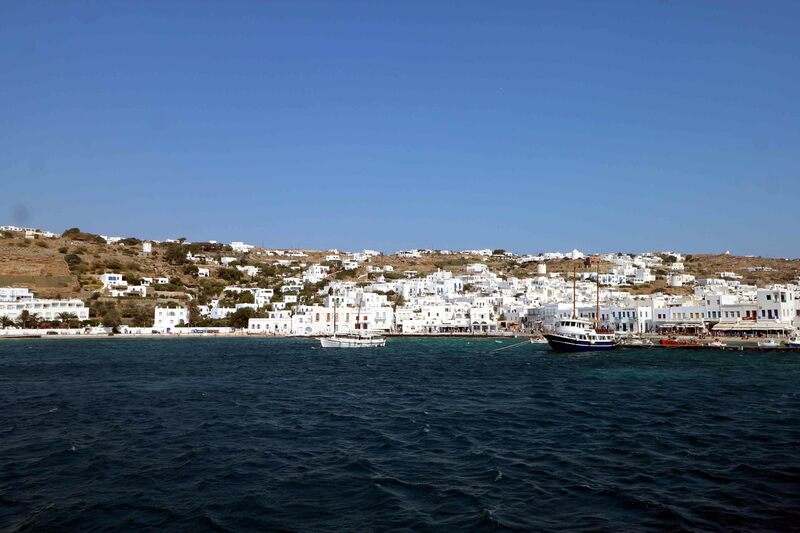 The island took its name from the grandson of Apollo, ‘Mykonos’. Some how, all these Greek deities still seem to be hanging in the air. It is mandatory in Greece for the houses to be whitewashed with blue painted windows and doors – the colour of the Greek flag. 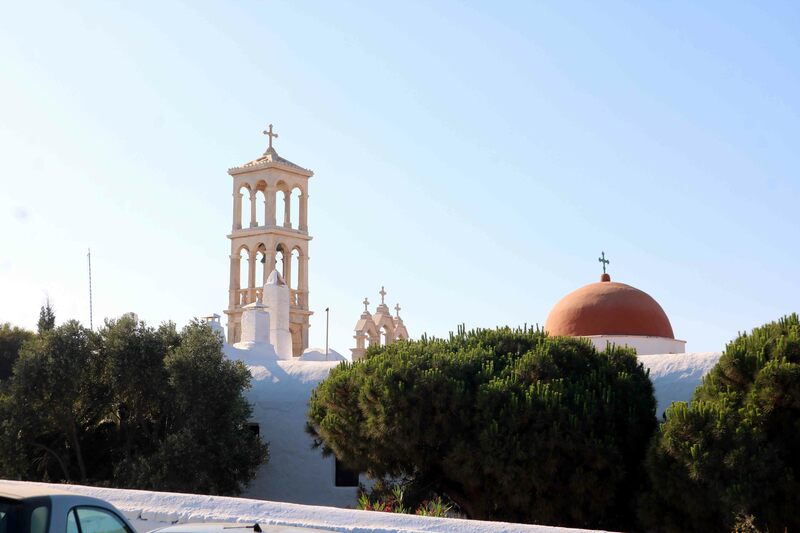 In 1974, the then military government made it a law that all houses must be painted in the beautiful Greek colors of white and blue as a patriotic gesture to represent the colours of the Greek flag. The law remains in place although some island authorities have begun to permit other pastel colours. 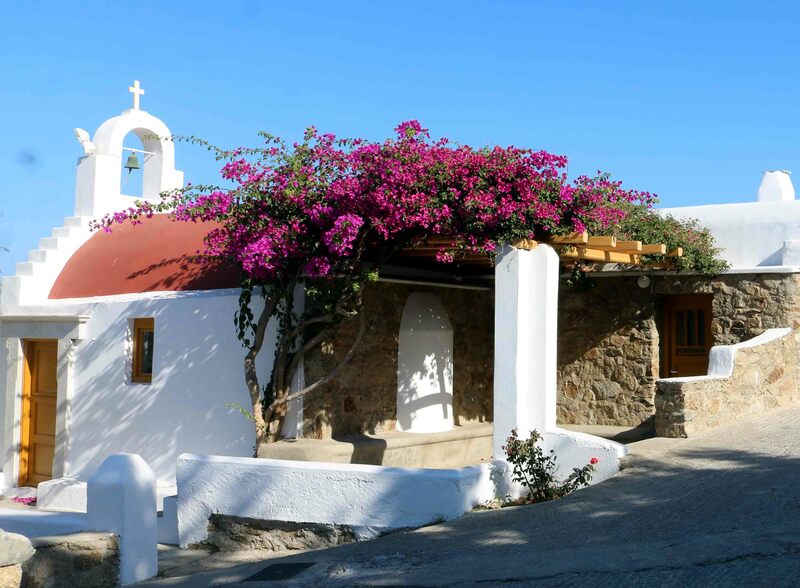 Mykonos is one of the islands of the Cyclades and is one of the most beautiful sites, very popular with tourists traveling to Greece. It is a relatively small island, measuring 85.5 km2; inhabited by about ten thousand people. Tourism is their mainstay and they receive visitors from all over the world with open arms. 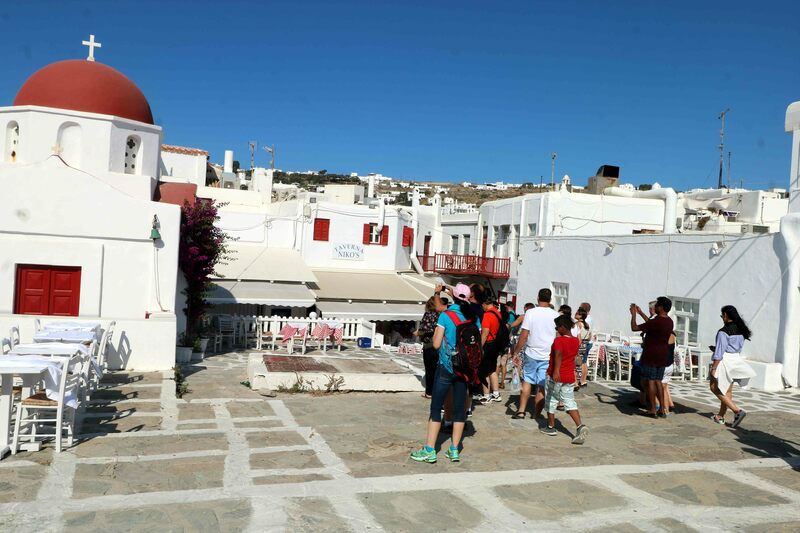 Mykonos has a rich night life with many restaurants and cafes which attract famous performers and the not so famous ordinary people and lots of young couple in love. Add white sandy beaches, crystal clear, blue green sea and breathtaking cliff-side views, make it a romantic paradise. Myknonian landscape is dotted with many churches and many more little chapels. It appeared that every household or family had a small chapel attached to their homes. Roof of these small chapels were painted blue, red or white, depending on the family occupation. Red indicated that the chapel belonged to a farmer family, blue meant the owning family are seafarers, sailors or fisher-folk, and white indicated that the family were migrants. .
As per Mykonian customs, the bones of a person buried in the church is excavated by the priest after six years and is handed over to the family. The family then place the bones in their family chapel. 98% of Greek population is Greek Orthodox Christians and the rest two percent is Muslims, Catholic and Jewish. Greece and Russia are the only countries to have such a great proportion of Orthodox Christians. Even though Catholics and Orthodox believe in the same God, they differ in that for Catholics deem the Pope as infallible while Orthodox believers don’t. Catholic priests cannot marry, while Orthodox priests can marry before being ordained as a priest. Latin is the main language used during Roman Catholic services, while Orthodox churches use native languages. Catholics venerate statues as much as Orthodox believers venerate icons. Our family belong to the Syrian Orthodox Church of Kerala, India. It is believed that Saint Thomas, disciple of Jesus, spread Christianity in Kerala in the First Century. These Christians received episcopal support from Persian bishops, who traveled to Kerala in merchant ships through the spice route. Hence they are called Syrian Orthodox Christians and use Syriac and Malayalam – language of Kerala – in their services. 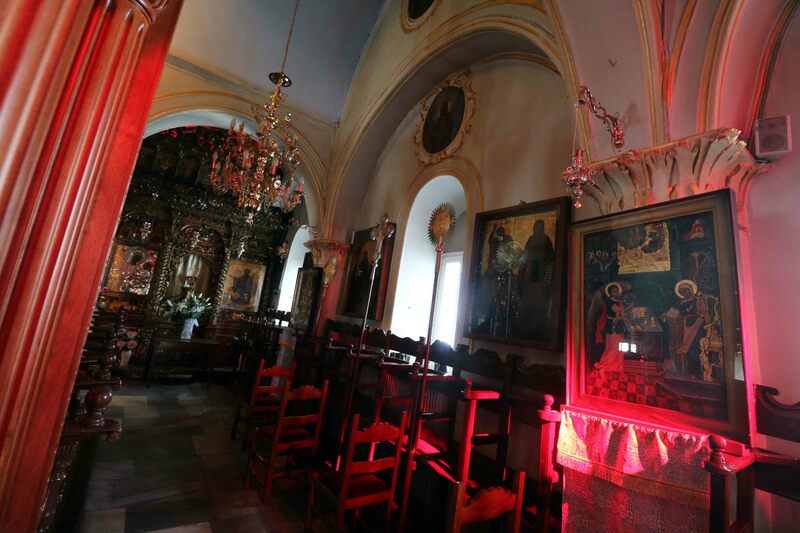 After checking into our hotel, we travelled to Ano Mera, a village about seven kilometers away to visit the 18th Century Monastery of Panagia Tourliani. The church looked almost similar to many of our Syrian Orthodox churches in Kerala. A marble bell tower with intricate folk carvings was a standout point of the church building. 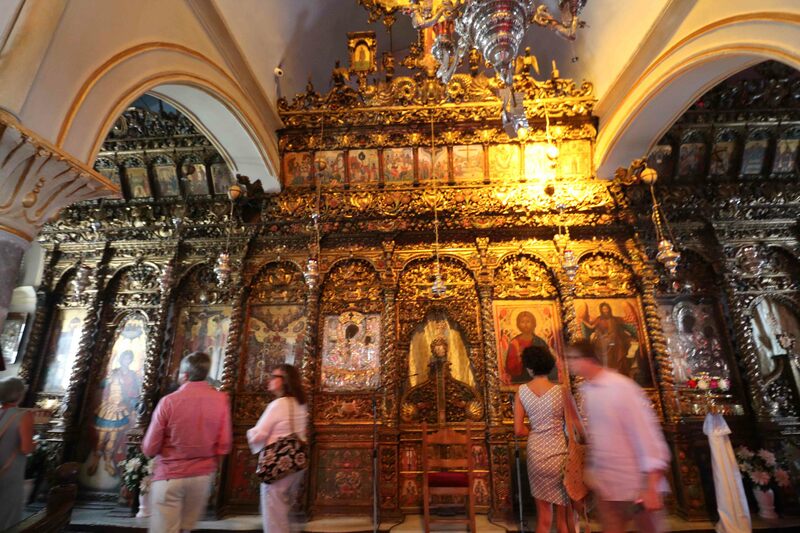 The altar screen, like those seen in our Orthodox Churches, has small icons carefully placed amid the wooden structure’s painted green, red, and gold-leaf flowers. At the top are carved figures of the apostles and large icons depicting the New Testament scenes. Most liturgical instruments used during prayers looked similar to those in our Orthodox churches. 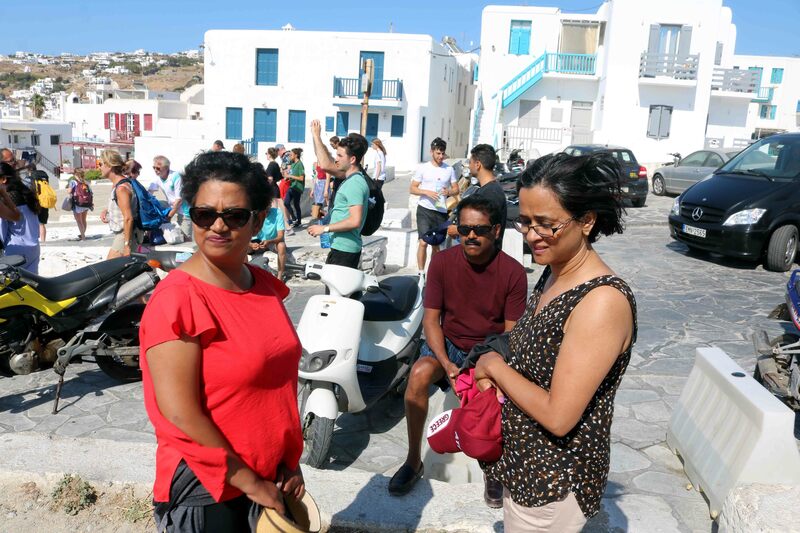 After lunch, we walked to the jetty at Mykonos Port to board a boat to the island of Delos. According to Greek mythology, Delos is the birthplace of Apollo, God of music, and his Moon-Goddess twin sister Artemis, Goddess of hunting. 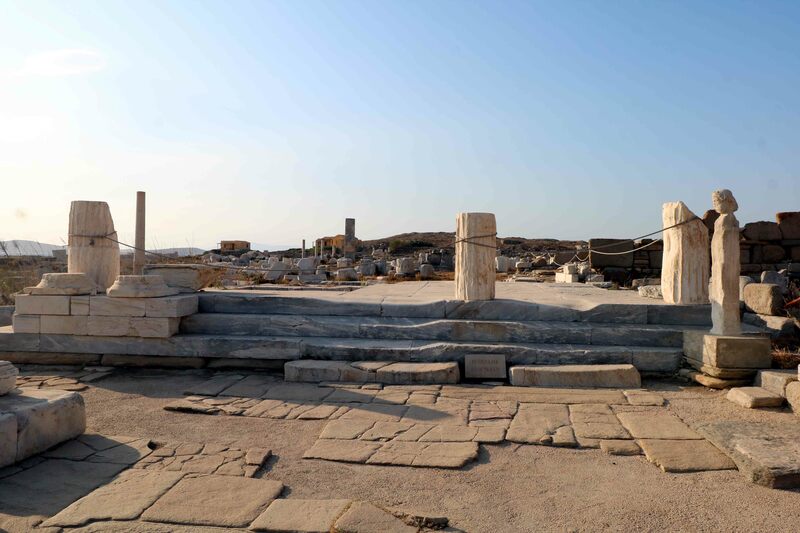 In 1100 BC, Delos was inhabited by the Ionians who worshiped God Apollo. (The Ionians were one of the four major tribes that the Greeks considered themselves to be divided into during the ancient period; the other three being the Dorians, Aeolians, and Achaeans.) The Ionians also managed to develop the island into a powerful commercial and spiritual centre (7th century BC). 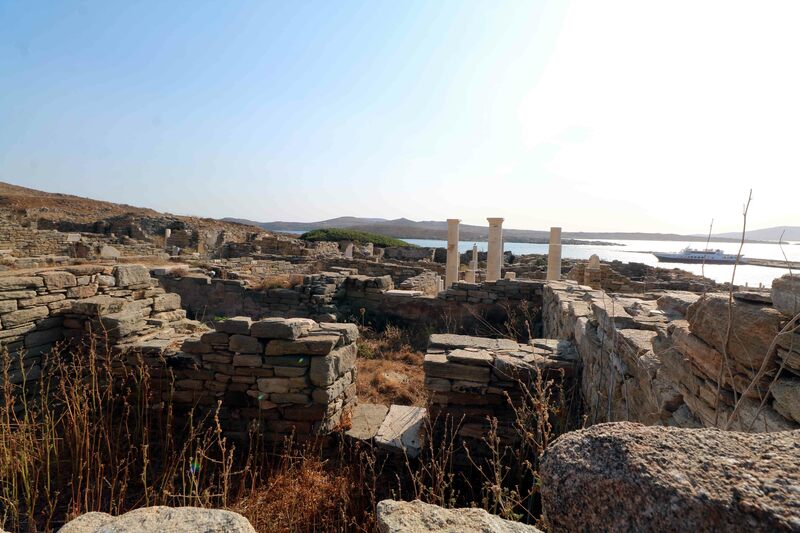 Thereafter, the Roman period was the most prosperous and wealthy period for Delos which turned the island into an important port. In 88 BC, the King of Pontos who was against the Romans completely destroyed Delos and Mykonos. 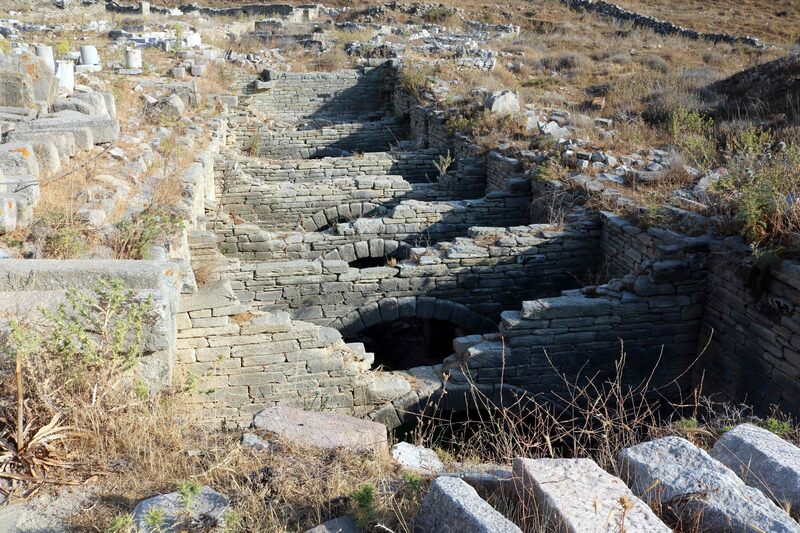 History of Delos remains completely unknown after this period as there are no historical records. 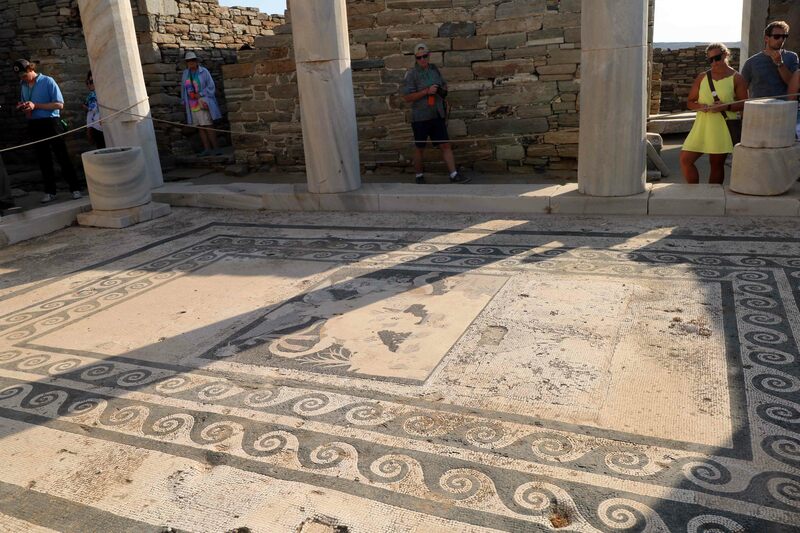 The excavations that brought to light rich archaeological finds in Delos started in 1873 and continue to be carried out by the French School of Archaeology. The island boasted of many temples, market places, living quarters, theatres, gymnasium, etc, all to cater for traders, sailors and locals. 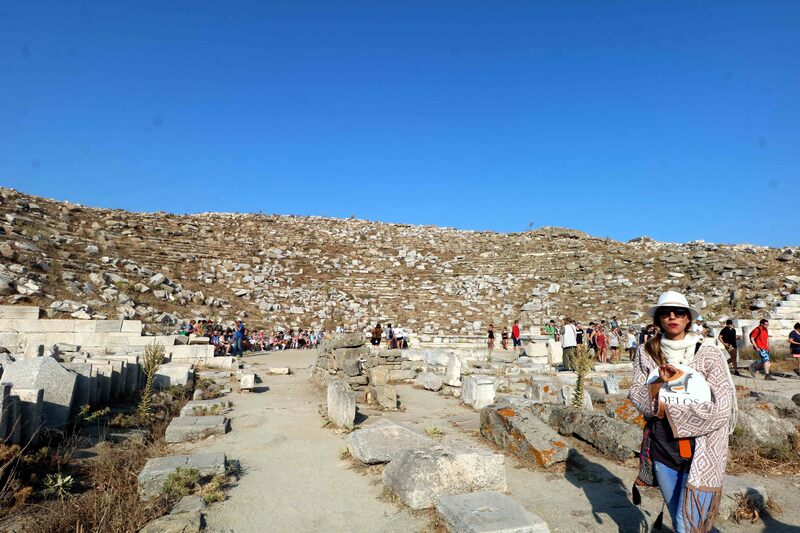 As trade prospered, rich merchants, bankers, and ship-owners from all over the world settled in Delos. They attracted many builders, artists and craftsmen to build luxurious houses, richly decorated with statues, frescoes and mosaic floors. This well preserved house has an atrium with a mosaic floor which portrays Dionysus seated on a leopard. 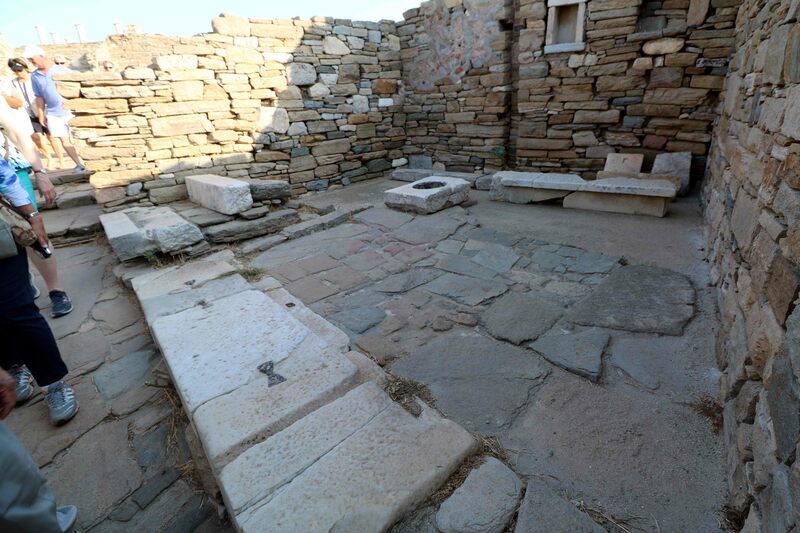 The houses in Delos varied in size, layout and construction based on the requirement and wealth of the owner. Most houses looked inwards and the rooms were built around an open square to allow air-circulation and to receive light. Ground floor rooms did not have windows making the houses cooler, safer and quieter. These houses had separate kitchen and latrines and drainage system. This is a theatre in ruins. Rainwater was collected in drains connected to a large reservoir. In the evening, we returned to Mykonos island, after spending over three hours at Delos. 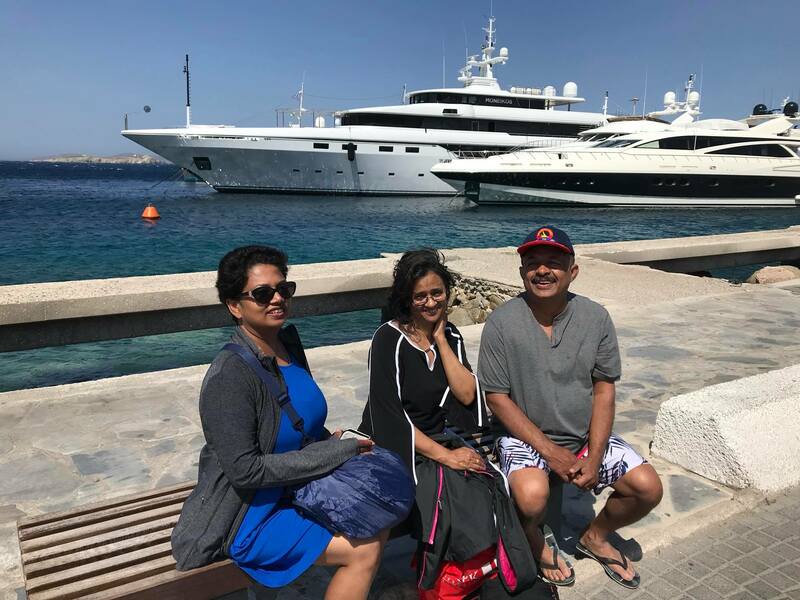 My compliments for giving us an excellent travelogue. We all travel some time or the other but never get down to putting together photos or the account of the places visited.